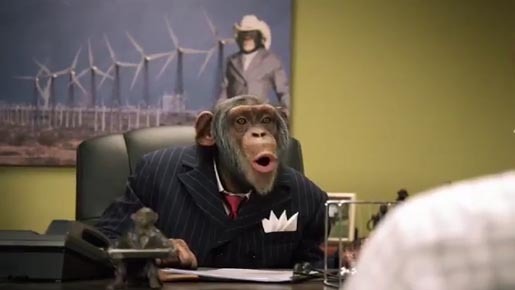 Careerbuilder.com is planning to run “Business Trip”, the latest instalment in the chimpanzees at work series designed for airing during the Super Bowl game on February 5, despite a campaign by Lincoln Park Zoo officials in Chicago to halt the commercial. The zoo officials are concerned that the images of the frolicking chimps are undermining worldwide attempts to protect the endangered species. Dr Brian Hare, an assistant professor of evolutionary anthropology at Duke University, is concerned about how a Super Bowl commercial, shown around the world, will persuade people in Africa, some desperately poor, to capture and sell the animals. “This advertisement teaches them there is a market for these animals, that there are some crazy people in America and Europe who would want them as pets,” he said. “Even if there isn’t a market, they think there’s a market.” That, he said, could devastate the wild population of chimpanzees that has already dwindled from more than one million to about 100 000.